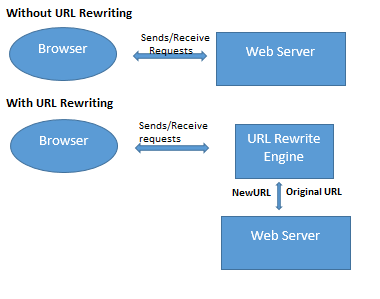 URL Rewriting makes your website SEO Friendly, more meaningful and independent to website’s resource. it works on web-server. Step1: Browser hits SEO Friendly URL to server. Step2: Server apply rewrite rule defined by administrator and fetches original URL. Step3: Server performs operation on original URL and Code. Step4: Server converts response to me delivered on SEO Friendly URL whi was recieved earliear.